Customized Water Systems increases industrial efficiency, life of systems and water safety in municipal applications by controlling bacteria, parasites and other impurities. Many of the most prestigious golf courses in the world have installed the LOPA/CWS water charging systems on their links to improve their turf and quality of play. 100% Green systems with proven observed benefits than can not be denied. Customized Water Systems contribute to the overall health of animals by reducing disease, pathogens and total cost of the animal maintenance. What is Customized Water Systems? Customized Water Systems is patented technology that will analyze your water and customize the science to meet your specific needs. 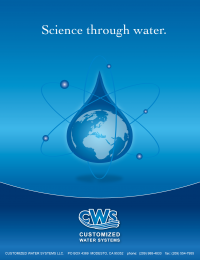 Customized Water Systems analyzes and introduces electrons into the water that allow plants and animals to function as if no negative toxins are present and utilize all nutrients as needed. Customized Water Systems is an eco-friendly, green light company that designs and supplies our customers with scalar energy water systems. We utilize our patented technologies, # 6,267,933 & # 6,974,561, to produce scalar energy in a very broad range of frequencies that improve soil, plant, animal health and industrial efficiencies. The representatives of Customized Water Systems have a broad range of experience in agriculture, industrial and turf grass successes that will always support our customers expected water quality improvement requirements. Download our brochure by clicking on the cover image. Please complete the form and our team will be in touch with you promptly.